Capsule Summary: An entire year passes for the 4077th: Hawkeye and B.J. try to build an artificial kidney machine; Margaret takes up knitting; Charles gets in over his head betting on baseball; and Father Mulcahy becomes a farmer. There’s no way to reconcile “A War for All Seasons” with the admittedly convoluted timeline of M*A*S*H. It simply can’t be done. That doesn’t mean it isn’t fun to try. It’s just easier to ignore the timeline entirely and consider this a standalone episode that exists on its own, unconnected to the rest of the series. It’s not like the homemade kidney machine was ever seen again, despite Hawkeye and B.J. spending months working on it. Nor do we ever see Margaret knitting after this episode. Father Mulcahy’s garden disappears entirely. The Sears catalog, seemingly so important to the 4077th here, likewise doesn’t make another appearance. If I had to pick a favorite storyline, I’d probably go with Hawkeye and B.J. building their kidney machine even though its more serious than any of the other storylines. It’s also vaguely reminiscent of how Colonel Potter was able to put together a Wangensteen suction in “Good-Bye, Radar (Part 1)” during Season 8. The Charles storyline also feels somewhat familiar or at least it reminded me of Frank betting on baseball in “Out of Sight, Out of Mind” during Season 5. I’m conflicted about whether or not Charles would demean himself by listening to baseball, even if he thought he could make some cabbage (or coleslaw or garbanzos). It’s a little disappointing that we don’t get to see Charles confront Klinger. Of course, few of the storylines get a solid ending. That’s the whole point of the episode. The year might end for the 4077th but the war doesn’t. It just keeps going. That said, Margaret’s storyline does conclude pretty definitively, unless she’s planning on continuing to work on her potholder-turned-scarf-turned-blanket. Also, Father Mulcahy’s garden was a success and stands ready to be revived in the spring. Hear ye, hear ye. Here’s to the New Year. May she be a damn sight better than the old one. And may we all be home before she’s over. In my opinion, Hawkeye and B.J. walking out of the Mess Tent and past Father Mulcahy’s dead garden would have been a much better way to end the episode. On the other hand, everyone sitting down to watch filmed highlights of the past year shows that life goes on. I hate Charles attacking the movie screen with a knife during the tag. That’s too wacky and crazy for Charles. It does provide a jarring end to a bizarre episode, however. 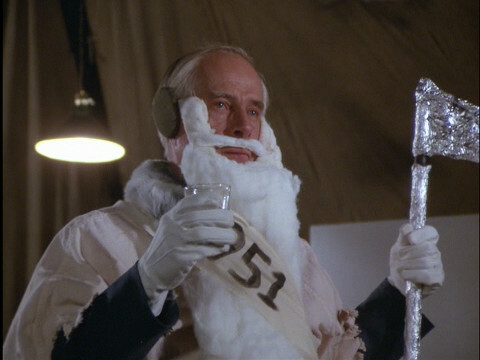 Colonel Potter toasts the new year. The game-winning home run that cost Charles so much money (known as the “Shot Heard ‘Round the World”) was hit by Bobby Thomson of the New York Giants during the final playoff game to decide the winner of the National League pennant. The game was played in New York City on October 3rd, 1951. The game really was carried on Armed Forces Radio for the benefit of military personnel in Korea. The broadcast heard in this episode is fake, however, and seems to be based on the famous Russ Hodges call over WMCA-AM radio in New York City. Perhaps some baseball or military experts can specify which radio broadcast would have been carried over Armed Forces Radio. It’s not believable at all that the Army would allow the 4077th to shoot off fireworks–or that Colonel Potter would even think about doing it. Speaking of fireworks, watch closely during the 4th of July party and you’ll see Charles lurking the background while Colonel Potter, Klinger, Hawkeye, and B.J. are placing their bets. With all that noise, it’s impressive he was able to overhear their conversation. This is my favourite episode. I don’t know why, but it clicks with me. Maybe it is because it has at least four different storylines. Another part of the reason that i like it is that it is so different to every other episode, because a) it is over an entire year, and b) it acknowledges that continuity errors occur in M*A*S*H, thus has lots of errors in it. Colonel Potter’s line ‘Hear ye, hear ye. Here’s to the New Year. May she be a damn sight better than the old one. And may we all be home before she’s over.’ always gets me in the gut. So passionately delivered, so believable, so sad. Margaret’s blanket’s (shall I call it that?) storyline is probably my favourite, as it is hilarious to see how indecisive Margaret really is. Charles and Klinger’s mystery tour of gambling is interesting, but a bit ridicouls. We all know Colonel Potter well, but would he really bet $100? Even with 6-to-1 odds? I can’t work that one out. Some of my favourite scenes from the episode: Mulcahy geting worked up at Igor for creaming his corn, BJ and Hawkeye listening to Rag Mop by the Ames Brothers and Charles getting angry at them, and the tag. It is nonsensical, but funny nonetheless. Didn’t Charles say in a previoous episode that he has really good hearing? Beacuse, if so, that justifies how he could have heard Colonel Potter, Klinger, Hawkeye, and B.J.’s conversation. Overall, I think the myriad of errors in this episode actually add to it, and that’s why I like it. Though I tend to think of this episode as a pilot episode of a similar, yet different show, not as an episode of M*A*S*H.
In an earlier episode Hawkeye states his pay is slightly over $400/month. As a colonel, Potter’s pay would be 3-4 times that. So a $100 bet on a near “sure thing” isn’t illogical. Charles did confront Klinger a bit earlier in the episode when things started to go badly for them, yelling at him for getting him to bet on a team with players like “Lyuke, Dyuke, and PEE-WEE!” [his pronunciation]. By the time it was all over for them, it was funny to see Charles “fainting” in the compound over his misfortune. It is pointless reconciling this with earlier MASH episodes on a timeline, especially since Col. Blake left the 4077th in fall 1952 and Potter arrived after that. There was so much going on in this episode, it’s hard to pinpoint one standout moment. One thing I must ask is what exactly are trocars and stylets. I apologize if I misspelled those words. Stylets are used inside an endotracheal tube to give it a certain shape which aids navigation of the tube towards the laryngeal inlet. I found it odd that Potter and Klinger, during their pitch-and-hit debate of the National League pennant, never mentioned the Philadelphia Phillies ,who were merely the defending N.L. champs. I agree with the consensus that later seasons are not as good as early seasons (for me the decline begins as Klinger becomes company cluck), so I find it odd that several of my favorite episodes are from the later seasons, this being one of them. Then you would like the 2002 TCF MASH set. As luck would have it, this episode became corrupt on my discs (skips and stutters), so I went to the library for their set, intending to copy this one episode. The TCF version gets to the point in the epilog where the newsreel shows the world series footage and you hear the first “the Giants win the pennant!” then abruptly goes to a black screen with no sound for about 20-30 seconds then the closing theme and credits. Reprehensible. a footnote on this episode: Ralph Branca was the Brooklyn Dodgers pitcher who yielded Bobby Thomson’s home run that gave the Giants the pennant. Branca passed away yesterday (11/23/2016) at age 90. He had a 12 year major league career, was a 3 time All Star, and appeared in two World Series (both losing efforts). Surprised nobody mentions the thick blue jackets that Hawkeye, Klinger, and multiple others wear throughout the episode. This is one of many times we see something like this in a single episode, but never see it otherwise, despite it having been very useful, such as these jackets in…every single “it’s too cold” episode of the show. On that note, with the SEARS catalog being seemingly easy to order from, why is it that there are many episodes where it’s way too cold and they don’t have any thing to stay warm, or is everyone so crazy over something like a bathtub in the episode where they ordered that? With literally nothing to spend their money on except alcohol, you’d think they’d be ordering from that catalog constantly so they always had supplies to make their lives there better. I know I would be. Also meant to add. I know that the events of the baseball game took place in 1951, and that the timeline as RJ said is impossible to make sense of, but it really seems to me this episode should have started with 1951 ending, and ended with 1952 ending. Potter, BJ, and especially Charles being there in 1950 doesn’t make any sense at all. The Korean war started in June of 1950, so if Potter, BJ & Charles were there in December 1950, it would mean Trapper and Blake were there for all of 2-3 months at the absolute most, and Frank there for 4-5 at the most, which obviously makes no sense at all. Again I know the timeline is impossible to piece together, but this always bugged me about this episode. How realistic is it that there would be fireworks on the fourth?Would the Army have provided them, or a local demolitions expert? Pretty realistic when you figure the Chinese invented fireworks and they see just a hop skip and a jump from the Chinese border. Plenty of fireworks in Asia. Even more than the US. I agree with R.J.–I would have preferred the episode ending with Hawkeye and B.J. walking out after Potter repeats his plea from the year before. It was a gut punch that still resonates with me 26-plus years after first seeing the episode. I didn’t like the bit where Igor creamed the corn. I thought it made him look needlessly stupid. Would it really have taken Hawkeye and BJ months to get their contraption working? And how long was Margaret going to be knitting, as well? The downbeat ending was in contrast to most of the rest of the episode. I wonder what their reaction was at the end of 1952? I often wonder whether MASH would stay on the air today in a world of playback on demand. It’s amazing that a show with so many errors would be as successful as it was. That’s a testament to the superb writing and acting which is missing in shows today. MASH had a lot of heart. But the fact that the writers thought the viewer would believe that the entire first eight seasons all happened in six months is simply ludicrous. Are we to believe that every episode represents one day? One week? Impossible when we know how long mail takes and some episodes begin with sending home for something and end with them receiving it. That’s at least a month in one episode. How could the writers think that dates weren’t important in a war? I’m guessing they believed that the viewer wouldn’t even know the dates the war happened so they would be ok. No Google back then. I do like the idea of imagining that Potter was Henry, BJ Trapper and Charles as Frank. Henry might actually dress up as Father New Year as he was always good for a laugh. Too bad BJ and Charles didn’t make us laugh the way Trap and Frank did. Wouldn’t it have been great if they could have talked McClean, Wayne, and Larry to cameo for the first scene? Oh the possibilities. Mulcahy’s “you creamed my corn” was one of the great lines. But I thought Igor didn’t even do the cooking and yet he claims he was just trying to be helpful with the corn. Another error or did he get a promotion after a year of being the server? Little mistake I spotted in the scene in the OR where Charles is offering 6-1 odds on the game. Potter is asking for more suction but there’s no nurse anywhere to be seen. Unless she was at the head of the table which wouldn’t make sense since he would need her across from him. This is an example of what Alan Alda called the armoire effect. Long story, but it’s basically where the actor is asked to accommodate the camera even if it hurts the actor’s concentration. For instance, speaking to someone who isn’t there or standing on an armoire so the camera can get a shot while pretending you’re on the ground as usual. I’m guessing the camera angle was such that in order to show both Charles and Potter in the same shot, they couldn’t have a nurse behind Charles. At the end when Potter shows the clip of the Giants winning the pennant, he says, “we just heard this and now we can see it.” That game was played at the beginning of October and this was January. I wouldn’t exactly call that just hearing it, especially considering days are very long in a war. But I guess it’s all relative.